Amplify your data with a selection from 14 fluorescence channels and an average of 40% less sample volume required. Easily and immediately switch between tubes and plates at the click of a button. Harmonize data with collaborating labs to ensure reproducibility. 1 Referred value indicates the average of multiple experiments and can differ for individual sample values. of 5000 cells/μL. The uptake volume was set to 50 μL at medium flowrate. 3 For carry-over, full 96-well plates were loaded with 200 μL/well of PBMC suspension at a nominal concentration of 5000 cells/μL in every other well (“SRC-wells”). Alternating wells are loaded with an equal volume of MACSQuant® Running Buffer (“CO-wells”). The uptake volume was set to 50 μL at medium flowrate. The carry-over is defined by sum(CO-singlet count)/sum(SRC-singlet count) ×100%. movement out of the last well. The measurements itself were carried out at the highest possible flow rate in fast mode measuring 5 μL per well. 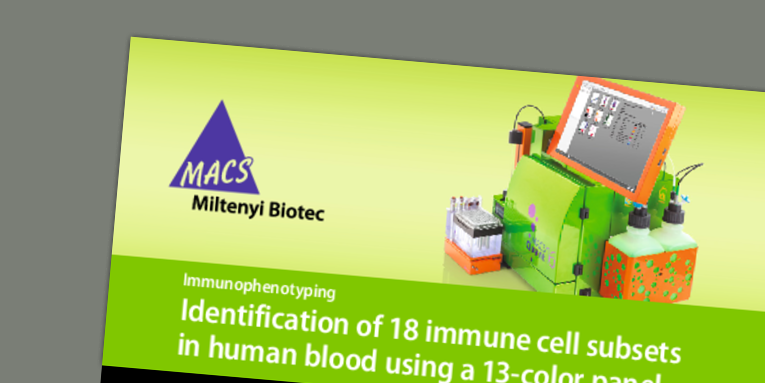 Colorful new possibilities in automated flow cytometry. Order no. 130-109-803. For research use only.